Forces from an Arab alliance have “freed” the airport in Yemen’s main port city of Hodeidah, the media office of the Yemeni military allied with the Saudi-led coalition said. “Army forces backed by the resistance and the Arab alliance freed Hodeidah international airport from the grip of the Houthi militia,” the media office said on Twitter on Saturday. Yemeni officials said dozens of pro-government fighters have been killed since the assault began, mainly from land mines and roadside bombs disguised as rocks or sacks of wheat. 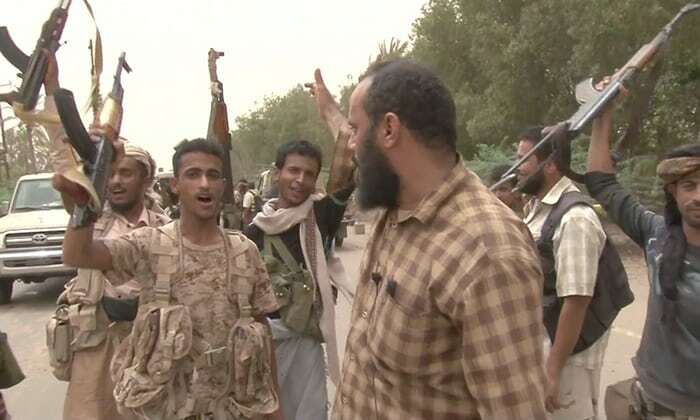 On the rebel side, bodies of Houthi fighters were strewn across the front lines. Aid workers have warned the assault on Hodieda’s port, known as the “mouth of Yemen,” could shut down the vital route for some 70 percent of Yemen’s food and humanitarian aid. Two-thirds of Yemen’s population of 27 million relies on aid and 8.4 million are already at risk of starving. The Saudi-led coalition accuses the Houthis of using the port to smuggle weapons and missiles from Iran. The rebels have been raining ballistic missiles down on Saudi cities from across the border. The port is also a lucrative source of revenue for the Houthis, who have controlled most of northern Yemen since 2014. The United Arab Emirates’ minister of state for foreign affairs, Anwar Gargash, said that the battle over Hodeida is essential to break a stalemate in the civil war, which otherwise could drag on for years. Hodeida, home to nearly 600,000 people, is some 150 kilometers (90 miles) southwest of Sanaa, Yemen’s capital, which is under Houthi control. The Saudi-led coalition has imposed an air, sea, and land embargo on Yemen since March 2015, aiming to dislodge the Houthis from the territory they control, paralysing trade and access to the country. The coalition air campaign and Houthi bombardment have left more than 10,000 people dead and 2 million displaced, and devastated the country’s already fragile infrastructure, including the health sector, which has helped spawn a cholera epidemic. In a series of tweets, the International Committee of the Red Cross said the people in Hodeida were “bracing for the worst,” and tens of thousands were expected to flee in the coming days, some for a second time. “People live in slums in the outskirts surviving on bread crumbs they find in the garbage. With the little money they do have, they buy cooking oil in plastic bags – just enough to cook one meal a day,” the group said, citing the accounts of staffers. Meanwhile, the US, which has backed the Saudi-led coalition with intelligence, logistical support and aerial refueling of fighter jets, has not publicly opposed the assault but has urged the coalition to ensure that humanitarian aid deliveries to the port continue. Washington however rejected three requests by the UAE to increase its support to the coalition with logistics, intelligence, and mine-sweeping operations. Marine Maj. Adrian Rankine Galloway, a Pentagon spokesman, said the US has continued to provide aerial refueling for coalition aircraft and intelligence assistance. That aid includes information on key civilian sites that should not be targeted in order to avoid civilian casualties. “We are not directly supporting the coalition offensive on the port of Hodeida,” Rankine-Galloway said. “The United States does not command, accompany or participate in counter-Houthi operations or any hostilities other than those authorized” against al Qaida and Islamic State (IS) group militants in Yemen. The request for mine sweepers was diverted to France, which said it was considering minesweeping in Hodeida after the end of military operations there. “Its purpose would be to facilitate the safe transport of humanitarian aid to the city’s population,” the French Defense Ministry said in a statement. The rebels have planted thousands of land mines and roadside bombs on the outskirts of the airport that have killed dozens of coalition-backed fighters, Yemeni officials said. The Conflict Armament Research Center said earlier that the bombs are similar to those used by the Iranian-backed Hezbollah in southern Lebanon and by Shiite insurgents in Iraq and Bahrain. “Nearly 95 percent of the causalities are because of land mines and roadside bombs,” said a medical official, who like the others spoke on condition of anonymity because they weren’t authorized to speak to the press. He shared pictures of land mines and roadside bombs that were disguised as rocks and sacks of wheat. Human Rights Watch urged the UN Security Council on Friday to warn the warring parties that they will face sanctions if they fail to provide civilians access to desperately needed aid. In the face of international concerns over the humanitarian situation, the UAE said on Friday that it would begin sending aid by air and sea to Hodeida, the state-run WAM news agency said. At least 10 UAE ships carrying 13,500 tons of food and aid, as well as three flights, were planned for Hodeida, it said.